There are some sporting teams that have engrained in their DNA the concept of never giving in regardless of the odds. Mergers, a step down to another competition. Other clubs could have folded or simply deemed the changes as “too hard”. On Saturday afternoon at New Era Stadium, the Western Suburbs Magpies put in a performance that epitomised the never-say-die attitude of the club. On paper the Cabramatta Blues looked to have all their stars aligned, the 2013 Ron Massey Cup minor premiership, a home ground advantage and a player alliance with the powerful Newtown Jets club. Throw in the loss of key Wests Magpies play maker in Nathan Waters and you’d think the Magpies would be gone for all money. Wests coach Leo Epifania and his team had other ideas as they took to the turf at New Era Stadium. They began the game well with full-back Sam Aiga showing a sure pair of hands as he returned high 5th kick bombs and ran hard and fast at the Cabra lines. Wests defenders in Tom Morrison, Seffa Silafau and Sonni Passi rolled up their sleeves and put in a workman like performance, making tackle after tackle against a Cabramatta side that looked ready to rip apart the Magpies. The pre-game script looked like it was going to plan after 15 minutes when Cabramatta after being held by Wests, broke though for a try thanks to a Tiger Vatuvei try. Jason Gray snagged the easy extras and Cabra were up 6-0. The Two Blues had another try on the board thanks to Danny Barakat who was able to break through and score despite some determined defence from Wests. It was starting to look ominous for the Magpies, who looked a little shaken without the steady leadership of Nathan Waters. Gray again converted and it was the home team leading 12-0. In one of the defining moments of the game, Magpies defender Tom Morrison made a crucial last gasp tackle on the speedy Jason Gray, who looked sure to score after a surging line-break for the Two Blues. Despite the tackle being crude and was penalised, this stopped an almost certain try and a possible scoreline of 18-0 that would have had the Magpies on their heels. Ron Massey Cup player of the year, Dean Rysko began to assert his class on the match, making surging runs at the Cabra lines and offloading to his wingers in Michael Stevens and Amanano Tovio. It was the speedy Tovio who made a superb surging run and offloaded to Michael Stevens who put Wests on the board and also converted. 12-6 in favour of Cabra. Amanano Tovio was again in involved in a scoring play when he found himself over the try line. This was on the back of some superb work by Sonni Passi. The big unit seemed to relish the pain of a solid hit up as he mashed his way through the Cabramatta defence, all with a smile on his face as if to say “stop me if you can”. The Magpies were back in the game as the half ended at 12-10. Cabramatta began the second half solidly. Danger player in Jason Gray was in everything using his pace and finesse in getting through the Wests lines. The defence was put under enormous pressure and cracked after a penalty was awarded to Cabra. Gray took the penalty shot and was successful and the Two Blues held a 4 point buffer. 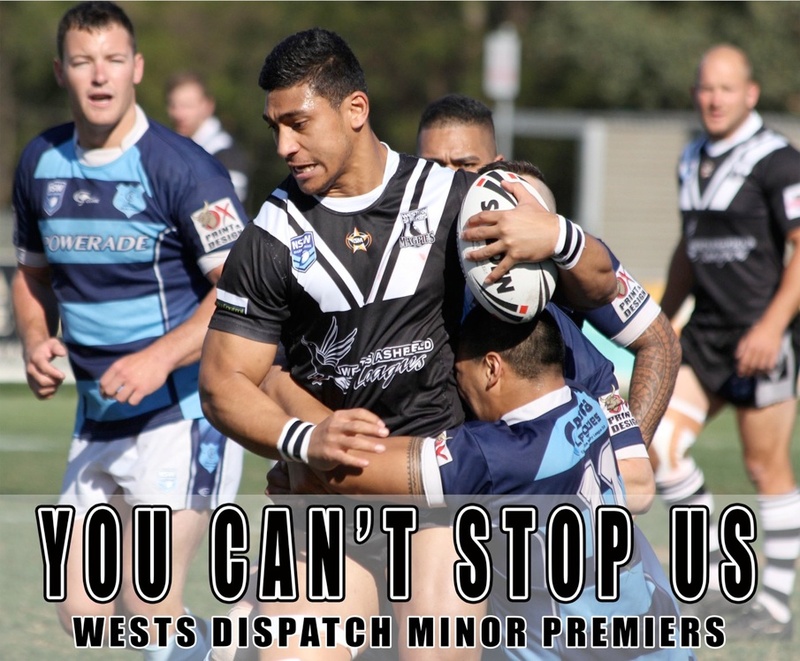 Wests began to increase defensive pressure on Cabramatta. They forced a number of handling errors and were able to cash in thanks to a second try by Amanano Tovio. Michael Stevens backed up his teammates work with a superb conversion and amazingly the Magpies had the lead 16-14. The belief in Wests began to grow and they took ahold of the game. They soon found themselves further ahead with a try which was constructed from a tackle steal by Brad Soe. Limoni Kamuia did the rest and scored a try. Stevens was unsuccessful with the conversion Wests up 20-14. In another key moment in the game with four minutes remaining, Wests defender Tom Morrison suffered a very nasty leg injury in a tackle tangle. Tom was in obvious pain and the game was stopped as team medicos provided treatment. It was a significant loss to the Wests bench who were under the pump from a Cabramatta team who refused to give in. After a couple of handling errors by Wests, The Two Blues were soon over the line thanks to a determined try by Ivan Penehe. Jason Gray made the crucial conversion and the game was tied 20-20 with extra time an inevitability. Both teams took the shortest of breathers with coaches quickly addressing their players. Wests Leo Epifania told his players “We can still win this” and made a point about the absence of injured teammate in Tom Morrison. That point was hammered home as the players paid full attention to their coach. The first period of five minutes could have gone to either side. Just when a team gained field advantage for a drop goal a handling error would creep in. This was finals pressure at its best. The next five minute period began in a similar situation, where both sides made errors at crucial times. In a Cabra charge down play, Wests were able to regather the ball and looked like scoring a field goal on the back of excellent field position. Sonni Passi had other ideas and decided to ice the game with sheer grit and determination, crashing through a tired Cabramatta defence and scoring a golden try. The Wests fans erupted deliriously, whilst the Magpie bench jumped for joy with club legend Mick Luibinskas fist pumping the air in disbelief. Coach Epifania had his back slapped hard by the Wests faithful. The other end of the spectrum saw a dejected, Cabramatta team whose players stared at the turf in the try zone after the Wests victory. This was classic, dramatic finals football and the West Magpies were deserving winners 24-20. Wests Magpies move to the preliminary final phase against Wentworthville, with the winner advancing to the Ron Massey Cup grand final. Kick-off is at 1.45 pm at Kogarah Stadium next Sunday. Triple H FM's Tony Dosen's thrilling final seconds call of the Wests Magpies v Cabramatta Ron Massey Cup finals match. Many thanks to Triple H FM Rugby League team for the grab You can tune into Triple H Rugby League broadcast on Triple FM 100.1 FM 12pm September 22, 2013.